You’ve gone for a shave at the barbers and it was such an incredible experience you want to do it for yourself. But, it must be hard to do yourself and require an expensive straight edge razor, right? 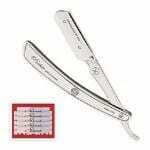 To shave like a pro with a barber straight edge you only need to use a shavette straight razor. In this article I am going to talk about the best straight edge razors to give yourself a barbershop quality shave. You’re going to be shocked how inexpensive it is to get started shaving yourself like a barber since you’re only going to need a disposable straight razor. No sharpening, no stropping and no complicated maintenance. If you don’t have time to read the whole article just take a look at the chart below for a quick comparison of these three disposable straight razors. Otherwise, read on for all the details about which is the best straight razor to DIY a great wet shave at home just like you would get at the barber. 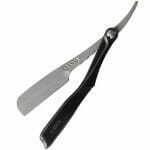 Great straight razor for barbers as it is easy to handle and has option for long blade. When you want some weight to let the blade do the work. Also safe to load. Advanced straight razor shavers since it mimics the traditional straight edge. What is a Barber Straight Razor? If you are a man of a certain age, you may remember going to your dad’s barber and seeing him stropping a razor on a leather strop. A long belt like piece of leather on one side and canvas on the other hanging from his chair. Before every shave, you would look on as he swiped the razor back and forth across the strop before putting the blade to the man’s beard. In the US, there is no state which allows a barber to use a traditional cut throat razor in the barbershop. They only allow disposable straight razors. Well, it has to do with non existent hygiene concerns. Their thinking is that using the same blade on everybody would spread bacteria. 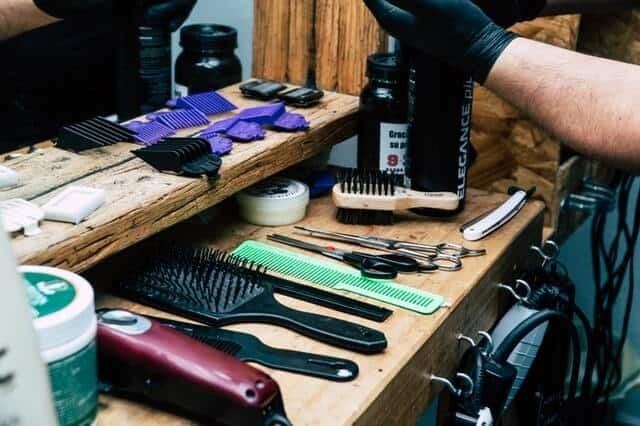 I would agree that it could happen in a dirty shop where the barbers don’t care for their equipment, but if that is already the case then you’re likely to pick up a rash from their other tools anyway. But, I digress. You may not have noticed when you were in the chair getting your shave that the razor was actually a replaceable blade straight razor. It was sharp, got you an extremely close shave and it felt really nice. No tugging, no razor burn and no ingrown hairs afterwards. To bring the same experience home doesn’t mean you have to spend a ton on a the best straight razor money can buy. Though, if you like the idea of having a traditional razor then you can check out my article on the best Dovo straight edge razors to see if it the better tool for you. What Are the Benefits of a Disposable Straight Razor? 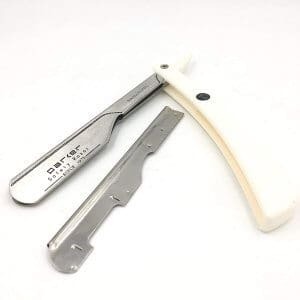 Whether you are a professional looking to get set up with your first barber straight razor or are a DIY shave enthusiast that is just looking to get into wet shaving, then you probably want to look into a shavette straight razor. They are very popular with barbers so it is highly likely this is the best straight razor type that you got your shave with. Since you’re using a disposable double edge blade for your shavette straight razor, there is no sharpening needed. They come ready to use right out of the box and are very sharp. Not as sharp as a professionally honed steel blade, but sharper than a cartridge razor by a long shot. The edge won’t last too long, though. Two to four shaves before needing to be tossed aside. It depends on how long your beard is when you shave as well as how thick and wiry your stubble is. If you work in a busy barbershop, then it is such a relief to not have to add to your workload by also needing to hone and strop your straight edge. One less thing to think about is always welcome. Stropping a razor doesn’t actually sharpen it. Only honing can do that. What ir does do is remove the imperfections caused by the honing and keep the blade aligned. Remember that when you hone a razor, it is being done by hand so nothing will be perfect. A double edge razor is stamped out by a machine so they are always uniform. They are always straight and with very little imperfections. Not to mention they are also meant to be thrown away when they are no longer as sharp as you like. After you’ve honed and stropped a traditional barber straight razor, you need to wipe it down and then coat it in some mineral oil to prevent any oxidation that could ruin the edge. You don’t have to worry about storage or any rust or other concerns. Just pop out the blade when you are done with it and toss it out. If you plan to reuse the same blade, you only have to remove it and wipe it down before using it a second time. I put the word sanitary in quotes because I think that a traditional razor is no less sanitary than a disposable straight razor. If you are taking care of your tools they are not going to spread bacteria. This includes your beard trimmer, nail clippers or any other grooming device. If you don’t take care of your straight edge, then there could be some pocking on your blade which could invite bacteria, however. Since you are throwing away the used double edge blade, you can’t really give yourself, or others, a rash or skin problem. So, in that sense they are easier to maintain than a straight edge so they can be considered more sanitary. This is the biggest reason for some people to prefer a replaceable blade straight razor. Shavette straight razors cost a fraction of what a traditional straight edge razor can cost you. Sure, there are some cheap ones out there that only cost a few dollars more than what you would spend on your typical shavette, but I would never recommend a cheap traditional razor. You don’t have to spend several hundred on one, but you’re going to spend considerably more than you would spend on an average disposable straight razor. The best straight razors can cost over a thousand dollars that the die hard straight shaving enthusiast has no qualms with paying. If you are a barber and just setting up your barber kit, it is really nice to not have to spend hundreds just for your razor. And the blades come in economical packs that can give you weeks or more of shaves. There are a few things to look for when buying your first straight edge razor. They are not all the same, even though they use the same double edge blades. Incidentally, you should see our list of the best double edge blades to make sure you’re going to get a first class shave every time. The best straight razor, whether we are talking about traditional or disposable, should be well balanced and a pleasure to hold and use. Some may look pretty cool, but are simply too awkward to handle and can be downright dangerous because of this. Before I get into the features you want in the best straight razor, let me steer you away from one certain type. There are the push type blade load ones where you load the blade by attaching it to an insert and then sliding it into the blade holder. I started out with one of these and sliced my fingers a few times before I gave up and switched to a Dovo shavette. The insert usually doesn’t hold the blade firmly enough and the metal on metal makes you have to use more force than you should to safely load the blade. Also, I find the length of the blade side way too long to be able to get the right angles to use safely. You can see the type I mean by the image below. On that note, this is one of the keys to a good shavette straight razor. You want to safely be able to load that blade. It should also be held securely. One of the other things I don’t like too much about that style of straight edge that I just mentioned is that eventually the insert can start going loose inside the blade holder. I find that they end up with a slight wobble which is disconcerting. You want that blade secured firmly in place with no give whatsoever. The ideal length is subject to interpretation. Your hands are different than mine so the hold and feel will vary accordingly. One thing that I really think is that the best straight razors are not too long. They should be on the shorter side, especially for beginners, since a smaller razor is easier to maneuver. When you are attempting to shave yourself with a straight edge, it is really important to be able to position the razor correctly and that is made more difficult when the razor is very long. This is one of the downsides to many shavettes and disposable straight razors in general. They can be quite light which is not what you want. They should be light enough that in a busy shop you don’t end up with hand fatigue by doing lots of shaves, but they should be weighty enough to make the shave easier. You want the razor to have enough heft that the weight of the razor does the work. You simply let gravity do its thing so you don’t have to apply much pressure against the skin to get close. They shouldn’t be heavy, however. That is not usually a problem with replaceable blade straight razor. This kind of goes back to the size of the razor. To properly hold onto the blade securely and still allow your hand to move to get the correct position, the handle, shank and tang should be easy and comfortable to grip. You should be able to have your first three fingers supported by the back of the blade side, with your thumb on the shank and your pinky finger resting easily on the tang. Since these two razors use the same double edge blade, it makes sense to compare them to figure out which one is best for you to use. The only difference with the actual blade is the shavette only uses half so it ends up as a single edge blade. How they function is entirely different. For starters, a shavette has the blade attached to a handle so it works in much the same way a traditional straight edge does. The razors folds up so the blade is secured inside the handle when not in use. A safety razor looks like a cartridge razor set up with the handle and a head on top. It uses the whole double edge, so you can shave in either direction with the razor. Who should use a shavette? I mean, anybody really can use a shavette, or any other straight razor, but I think they are better suited for the professionals. It is much easier to use a straight razor when shaving somebody else than to contort yourself to use it on your own face. I think they are better suited to barbers and professionals than the home wet shave enthusiast. There is a steep learning curve to using one in general and that becomes steeper when you are trying to shave yourself. If you are bound and determined to learn how to use a traditional straight edge razor, then they are a great starting point since you don’t have to also learn how to maintain a blade. You can focus on how to do the shave correctly and then once you have it mastered, you can graduate to a traditional. If you want to learn more about how to use a straight edge razor then follow that link to a more detailed article. Who should use a safety razor? With a less steep learning curve than a straight edge or shavette razor, the safety razor is the logical first step up from a cartridge razor system. If you want to do a wet shave and use an incredibly sharp razor to complete the picture, then the best straight razor to use is actually a safety razor. The way they work is not too unlike using a disposable razor like a Fusion, but there is still a right and wrong way to use one. They’re just so much easier to use than a shavette straight razor. I wouldn’t recommend a safety razor for a barber to use. 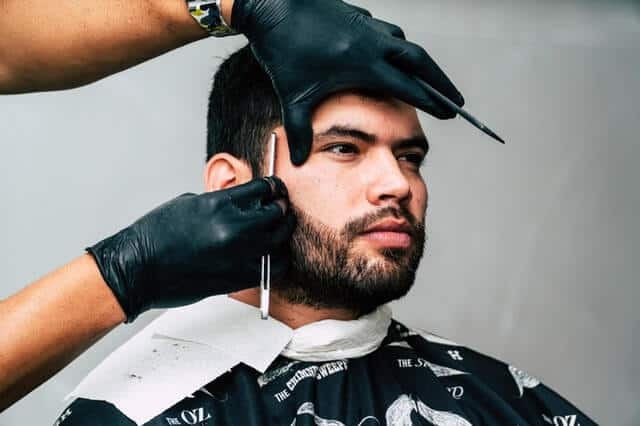 Though there is nobody telling you that you can’t, unless the local barber board doesn’t allow any type of shaving in that area, it’s just not actually as easy to use on somebody else as it is to use on yourself. To shave another person’s face, you will need the dexterity that you can only get by using a shavette. To learn how to use a safety razor to do a wet shave then that link will take you to the full article. There are an absolute ton of so called shavette straight razors out there, so I want to focus on the brands that have been around for a while and I think make the best straight razors in general. So, this list is by no means exhaustive. There are three brands that I think are the best ones to look into. Parker, Feather and Dovo. In fact, Dovo coined the name Shavette. So, a shavette is not actually a type of razor, it is the name of a specific model of Dovo that has become synonymous with replaceable blade straight razors. Much like a Q Tip is a brand name and it has become what we call any cotton swab. Go into any barber shop and it’s a good bet you will see any of those brands represented as the barber straight razor of choice by at least one of the guys there. Let’s start our list of the best straight razors with the iconic Dovo Shavette. As I mentioned, this is the actual, original Shavette that has become an icon in the world of shaving and can be found in many barbershops around the world. The small profile makes this barber straight razor so easy to use when shaving a client or, if you are shaving your own face. This barber straight razor has been with me for the last 10 years. I have only needed to replace it once and that was after probably seven or so years of heavy use in a busy shop doing multiple shaves per day. You have two options for using this shavette which not many others have. 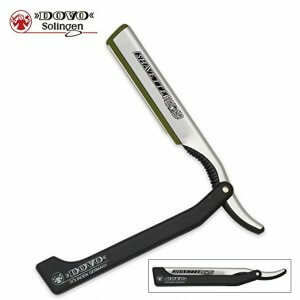 You can use any double edge razor blade broken in half, or you can order some longer Dovo razor blades if you want a similar experience to a traditional straight razor shave with a longer blade. You can order those longer ones here from Amazon.com. Either way you get a great shave. The total length of the blade holder is 5 and ¼ inches, which is shorter than most traditional straight razors and even slightly less than some other shavette straight razor models. When you flip your wrist to shave the side of the face of your dominant hand, you will love this shorter length. Be careful if you use the longer Dovo razor blades, however. The blades are inserted into a plastic holder which then slides neatly into place in the blade holder. You have a red one for the regular size DE blades and then a longer black one, which also features some snaps to hold it in place more tightly. It is easier and safer to load with these plastic hinged loaders than your typical push type load razor as you are pinching the blade closed between the two sides of the plastic for a firm hold. The one negative is that if you are using this barber straight razor in a busy shop and changing blades all day, then the red plastic insert eventually gets weak. I had a few replacements on hand for when this would happen. The handle comes in either a hard resin or stainless steel. I love that the shank actually has some jimps so it provides a better grip. You don’t see that on too many shavettes. If I could change anything about the Dovo Shavette it would be to add a little more weight to it. It is a bit on the lighter side so an inexperienced hand might apply too much pressure to get a closer shave. Is this the best straight razor? 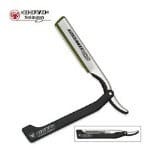 I don’t know if I am just being sentimental because I have used this shavette for so long or have become a creature of habit, but I will always be using the Dovo Shavette in the barbershop. I have tried so many others and this one really is just perfect for me. But it is not the actual best straight razor, as that one you will see is coming up. The price is good. It isn’t the cheapest, but it also isn’t the most expensive. The option to use the long blades comes very welcome, too, especially if you want a traditional straight edge experience. A very solid runner up as the best straight razor in my mind to the Dovo barber straight razor is the Parker SRX. Though, there are plenty of people who would give this disposable straight razor the nod over the Dovo Shavette. One thing in my mind that is much better is the weight. At 2.3 ounces it is just heavy enough to let gravity take over during the shave so you aren’t exerting any pressure on the blade against the skin. There is a very nice balance to it so it just rests easy in the hand. The only thing missing regarding the grip is it doesn’t have any jimps on the tang. I doubt you’ll see your handing slipping off of it, though. There is a spot for your thumb at the heel end of the blade holder, which I am not crazy about. I think this is subjective though and it may only be because I am used to keeping my thumb towards the end of the shank, basically up against the handle. If you generally keep your thumb closer to the heel, then you are sort of forced to keep it there. This may be fine if it is your first barber straight razor. I also really like the style of blade loader it has. The two sides of the holder swing open and you simply lay the half DE blade in where it lines up nicely. Then close them and swing down the back brace that keeps the blade tucked inside. It is very safe and practical to load the blade this way. I love the classic, kind of throw back look to the design. Even though it is a disposable straight razor it looks a bit like a traditional straight edge with the engraving on the side of the blade holder. The general shape, plus the exquisite balance, will give you a very nice range of motion. Aside from that thumb cut out, you can hold onto it in such a way to let your wrist take on most of the movement without moving your hand around. This gives you the correct angle to come at your stroke. There is very little negative you can say about this or any other Parker straight edge. They have the professional in mind when they design their tools so you know the quality is going to be at a high level. And as a home shaver looking for the same professional quality shave with a disposable straight razor, you really get more than what you pay for. The price is great considering the quality. As I mentioned before, I am a Dovo Shavette user and stick with it. But, I have tried this incredible shavette and have to say that it is much better than the Dovo. In fact, in my mind it is the best straight razor on the shavette market with one exception. And the exception is another Feather called the Club SS, but I don’t include it because it costs as much as some traditional straight edge razors without too many upgrades. It isn’t perfect so I will highlight the points I wasn’t crazy about and the reason I stick with the Dovo. First, the points that put this in the best straight razor category. The precision and craftsmanship is evident as soon as you take the Feather out of the package. It feels solid in the hand and looks elegant. The blade holder and shank are made out of a polished stainless steel that looks similar to nickel. The handle is very solid and has an interesting shape that actually has a purpose. When the razor is closed, you can use the handle as a stand and sit it upright. This also highlights is really good looks. Even the pin that connects the handle to the shank is stylish and really big. The way the blade sits inside the holder makes it very hard to tell that this is even a shavette and not a traditional blade straight razor. This is a good and bad thing at the same time, but I will go into more detail about that in a second. Made out of a super engineered resin, it is solid and can even be heated to over 235°F. This means that if you need to autoclave your razor, it won’t be affected at all. This is a great way to keep your stuff disinfected and in some states is required by the local barber board. 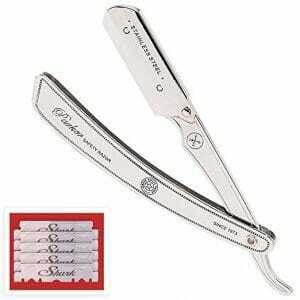 I love this as a barber straight razor because of that kind of attention to detail towards professionals. Loading the blades is totally unique and a huge selling point. If you opt for the Feather Professional blades, which I recommend as they are incredible, then the box they come in is the loader for the razor. The way this replaceable blade straight razor works is that you pinch the top of the blade holder which opens it up. Then the box for the attaches to the razor and all you have to do is slide the blade right into the razor. You never even touch the blade at any point. To empty it, you just pinch the top again and the blade drops out. You can use any other single edge blade, but you can’t use other standard double edge ones as they won’t fit properly. To clean inside, simply pinch the top of the blade holder as if you are going to load it, and slide the top portion off. Then just clip it back when done. The quality of the shave is phenomenal and makes it ideal as a barber straight edge. To use it on yourself will also produce exceptional shaves, but this is where the big downside comes in. There is very little blade exposed so the angle has to be just right. And since the blade holder is slightly rounded at the blade edge, if you are too low and angle, then it will rub against the skin. This interferes with the blade and you won’t end up with a very close shave. When you get the angle right it is the best straight razor. The Feather Professional blades are probably the sharpest and most consistent on the market. When you don’t get the angle right, you will wonder what the fuss was about. If it were thinner in that spot it wouldn’t be an issue so I wonder why they designed it in that way. The only other downside is that it only takes the longer single edge blades so it is more expensive to use. Yes, those blades are super sharp and will give you a more traditional straight shave experience without the honing and stropping, but it can add up. Other than that, it is a really unique and high performance disposable straight razor that seems like it should cost way more than it does. I really recommend this disposable straight razor to both professionals and amateurs alike as it delivers an excellent shave. As far as replaceable blade straight razors go, it is the closest you can get to feeling like you are shaving with a traditional cut throat razor. I may just be tempted to go with this as my prefered barber straight edge when my Dovo Shavette replaceable blade straight razor gives up the ghost! There are a lot of replaceable blade straight razors out there that are also very good. It’s just I think you can’t miss with any of these three especially if you are looking for a barber straight razor. The best straight razors need to have the qualities that these three in particular all have. And, with any of these you can safely shave your own face and may not ever feel the need to upgrade to a traditional cut throat. Especially with the Feather SS, you’ll forget that you’re even using a disposable straight razor! If you have any questions about these shavette straight razors, or any others, then reach out by adding a comment in the box below. I love talking about shavette straight razors so I will be happy to help. Maybe none of these are going to do the trick and you need a recommendation for another that I think may be the best straight razor for you. I’m happy to help.